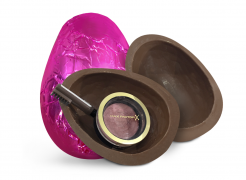 Chocolate Maxi Easter Egg in Coloured Foil. Hollow Large Egg. Premium Milk Chocolate. 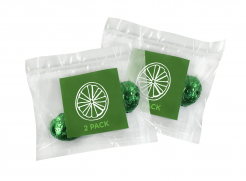 Available in 26 foil colours, choose the colours to match your theme or branding! 120mm x 80mm. 100g. 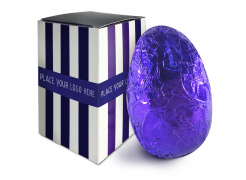 Chocolate Maxi Easter Egg in Coloured Foil with additional customised packaging. 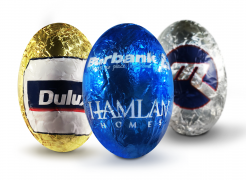 Hollow Large Egg, Premium Milk, Dark or White Chocolate. Available in 26 foil colours, choose the colours you want to match your theme or branding. Additional bagged and customised sticker. 120mm x 80mm. 100g. 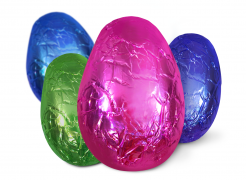 Chocolate Maxi Easter Egg in Printed Coloured Foil. 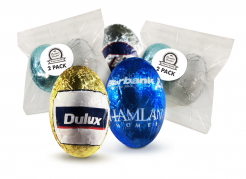 Hollow Branded Large Egg, Premium Milk, Dark or White Chocolate. Available in 26 foil colours, choose the colours you want to match your theme or branding. 120mm x 80mm. 100g. 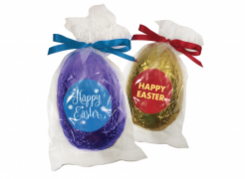 Chocolate Maxi Easter Egg in Coloured Foil with additional customised packaging. Hollow Large Egg, Premium Milk Chocolate. Available in 26 foil colours, choose the colours you want to match your theme or branding. Additional bagged and customised sticker and optional ribbon. 120mm x 80mm. 100g. 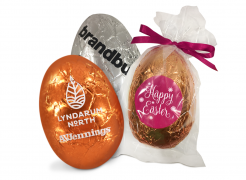 Chocolate Maxi Easter Egg in Coloured Printed Foil with additional customised packaging. 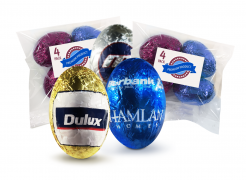 Hollow Branded Large Egg, Premium Milk Chocolate. 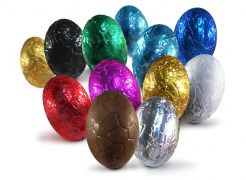 Available in 26 foil colours, choose the colours you want to match your theme or branding. Additional bagged and customised sticker and optional ribbon. 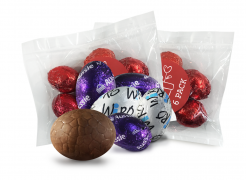 Chocolate Bunny Head in customised packaging with optional toppings. Moulded Bunny shaped Head. Premium Milk, dark or white Chocolate. 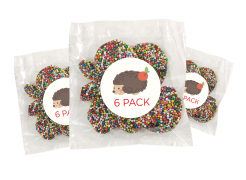 Bagged with customised sticker and optional ribbon, sprinkles or hundreds and thousands. Sprinkles available in 9 colours. 85mm x 70mm. 40g. 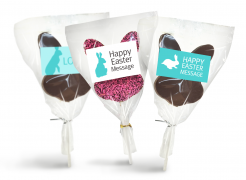 Chocolate Bunny Head in customised packaging and sticker. 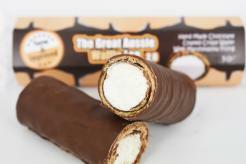 Moulded Bunny shaped Head on a lollipop stick Premium Milk, dark or white Chocolate. 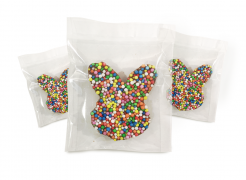 Bagged with customised sticker and optional ribbon, sprinkles or hundreds and thousands. Sprinkles available in 9 colours. 85mm x 70mm. 40g. 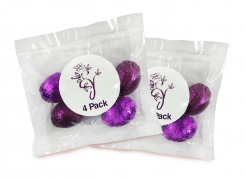 Chocolate Small Bunny heads and Easter Eggs with optional toppings 4 Pack with customised sticker. 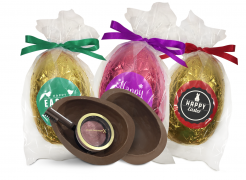 Chocolate moulded small Bunny shaped Head or Easter egg in 4 Pack with Customised Sticker. Premium Milk Chocolate. optional sprinkles or hundreds and thousands. Sprinkles available in 9 colours. 40mm x 30mm. 30g. Chocolate Small Bunny heads and Easter Eggs with optional toppings. Single chocolate moulded small Bunny shaped Head or Easter egg. Premium Milk Chocolate. Bagged with optional sprinkles or hundreds and thousands. Sprinkles available in 9 colours. 40mm x 30mm. 7g. 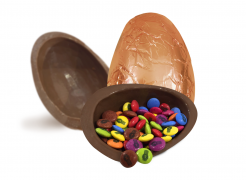 Chocolate Small Bunny heads and Easter Eggs with optional toppings 6 Pack with customised sticker. 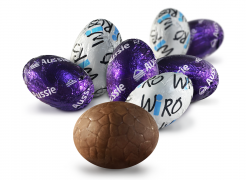 Chocolate moulded small Bunny shaped Head or Easter egg in 6 Pack with Customised Sticker. Premium Milk Chocolate. optional sprinkles or hundreds and thousands. Sprinkles available in 9 colours. 40mm x 30mm. 60g. 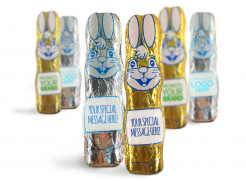 Chocolate Lindt™ Bars in Coloured Foil with customised wrapper. 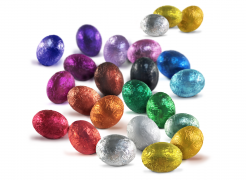 Lindt™ Extra Creamy Milk or Dark Chocolate wrapped in custom foiled colours. Available in 26 foil colours, choose the colour/s you want to match your theme or branding. 110mm x 50mm. 35g. 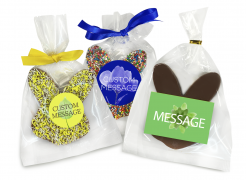 Chocolate Bunny with Sprinkles & Marshmallow Tail in a Clear Bag with a Custom Printed Header. 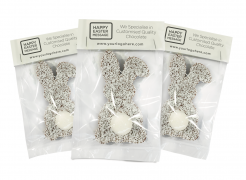 Chocolate Bunny shaped with white sprinkles and marshmallow tail in a clear bag with a customised printed header. Premium Milk Chocolate. 115mm x 65mm. 45g. 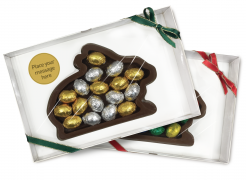 Chocolate Bunny shape in Coloured Printed Foil. 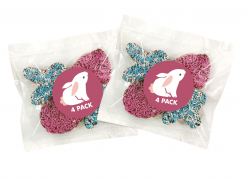 Whole bunny shape in printed foil. Premium Milk Chocolate. Available in 26 foil colours, choose the colours you want to match your theme or branding. 165mm x 40mm. 100g. 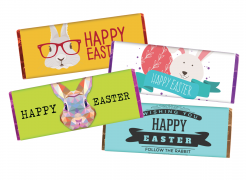 Chocolate Large Bars with a Moulded message in Coloured Foil with customised wrapper. 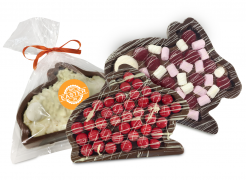 Large Chocolate Bar with a moulded chocolate message. 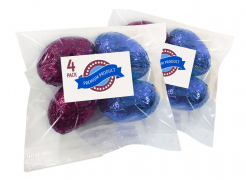 Milk or Dark Chocolate wrapped in custom foiled colours. Available in 26 foil colours, choose the colour/s you want to match your theme or branding. 145mm x 55mm. 60g. 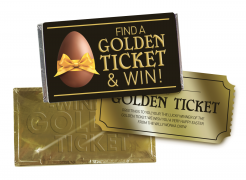 Chocolate Bars with a Moulded message in Coloured Foil, customised wrapper & a ‘Golden Ticket’ Make your own Easter competition! 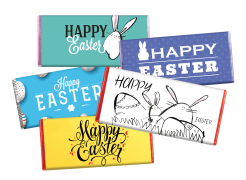 Large Chocolate Bar with a moulded chocolate message. 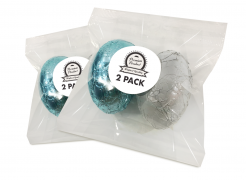 Milk or Dark Chocolate wrapped in custom foiled colours. 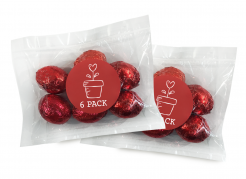 Available in 26 foil colours, choose the colour/s you want to match your theme or branding. 100mm x 55mm. 40g. 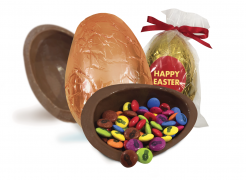 Chocolate Maxi Easter Egg in Coloured Foil with Smarties inclusion and customised packaging. 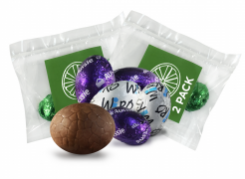 Hollow Large Egg with a surprise Smarties inclusion packed in clear bag and customised sticker. Premium Milk, Dark or White Chocolate. 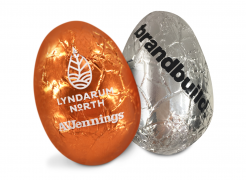 Available in 26 foil colours, choose the colours to match your theme or branding. 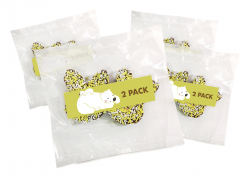 Chocolate shaped bunny with flavoured fillings in a clear bag and customised sticker. Solid Moulded Bunny, with flavour fillings. Available in Premium Milk, Dark or White Chocolate. 4 Flavours to choose from. Customise your sticker your own message, design or branding. Bunny: 170mm x 125mm x 30mm. 250g-350g.